Silver Ointment contains pure silver which, by way of the enlarged surface area, leads to continuous release of silver ions. This allows the silver’s antiseptic effect to unfold, pushing back bacteria. Infections abate which allows the skin to calm and regenerate. High quality plant oils provide cracked, dry skin with moisture making it smooth to apply! 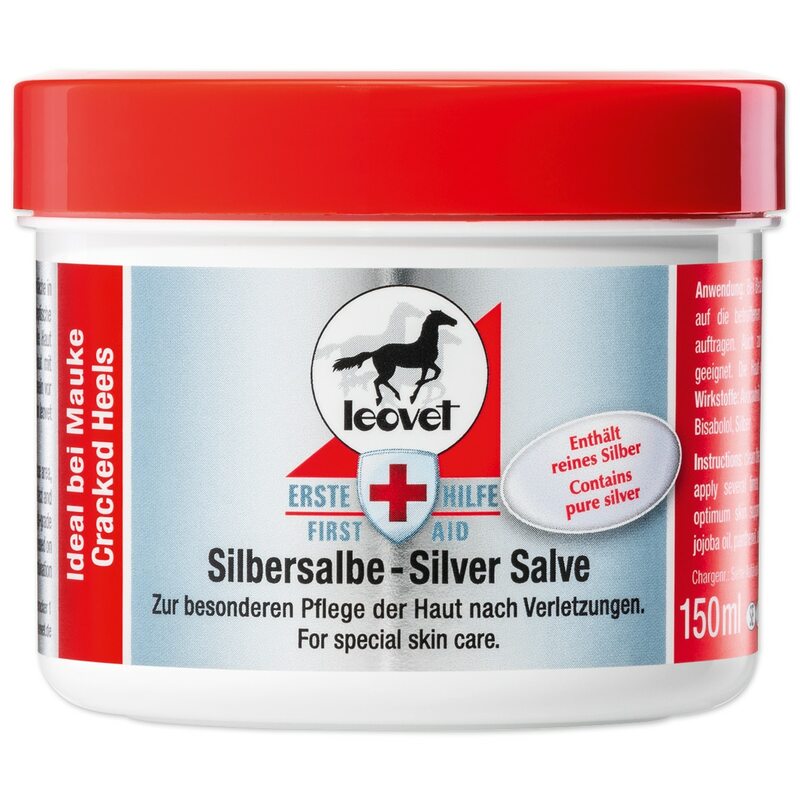 Leovet® Silver Ointment is rated 4.9 out of 5 by 10. Rated 4 out of 5 by skjs18 from Works pretty well I was looking for a thicker ointment to use on a couple of fetlock and hock sores. My horse has been battling laminitis and getting up and down has been less than graceful. I've got fetlock shields, but when they get wet, I like to leave them off overnight to dry. This ointment provides a nice protective layer to the skin and seems to really promote healing. The skin over the rub spots is filling in and becoming a lot less irritated. It's a bit pricey, though a little covers a fair amount, so depending on how long a jar lasts, cost might end not too bad. Rated 5 out of 5 by Emily from Pretty sure this stuff is magic I work at a stable and one of the horses had terrible heat bumps that burst open. They had been on going for a while and it seemed like I had tried every medication in the barn and nothing would make a difference. I ordered this for a try and I could literally see the bumps shrinking every day. They went from quarter sized to pea size in one week. I’ve already ordered 3 more jars for the stable and my sensitive skinned personal horse. I swear this stuff if magic! Rated 5 out of 5 by displacedtexan from An Absolute Must Have For Scratches & Cuts I have fallen in love with this product. Effectively treats cuts and sores that our horses come in to the barn with, and seems to speed up the healing. I have also used this with a nasty blanket rub spot with great success. Rated 5 out of 5 by TomVos from Great Stuff! I really like this stuff. Cuts and scrapes seem to heal fast and the consistency is really good and adheres to the cut. Has worked very well on hock and ankle bed sores. Rated 5 out of 5 by Kara from Awesome for rubs and cuts This has been great for my mares rubs and my geldings playful bite marks from turn out. Rated 5 out of 5 by Arabrider from Incredible product I bought this two weeks ago for my mare's type 2 wound on the back of her hind fetlock she injured it 5 weeks ago and this has been a struggle to heal due to movement and she is stall walker. It started out about 1.5 inches high by about three inches wide. I was treating with a Circa Care patch the vet gave me, but it sometimes made it funky, stinky or just gross, then she lost it one day when she got her wrap off. I have started using this product and it has suddenly begun to heal rapidly and it's never stinky or smelly or gross. I HIGHLY recommend this product, it is pricey, but for how effective it is it's well worth it. I put it on a non stick pad, then wrap gauze to keep it in place then vetrap and finally a standing bandage. Rated 5 out of 5 by Thoroughbredlove from Very good product This is pricey but seems to be helping a tough case of scratches and my horse tolerates it and doesn't like me putting any sort of salves or medicines on him to begin with. Manuka honey is the only other thing he allows on his skin, lol! I'm sure a little goes a long way but with scratches, I tend to put a lot on but if it kills it, then it will have been money well spent. Rated 5 out of 5 by Sweeties Mom from Very Effective for Wounds!! I had purchased this as my mare had scraped her shoulder pretty good and needed a good ointment to speed her healing. This is easy to apply and her shoulder healed nicely and I feel that the ointment/cream hastened the process. Rated 5 out of 5 by piaffing chicken from Only thing to work on pastern dermatitis! After spending literally $100.00's of dollars on cremes,sprays and antibiotics I finally got a product that started working immeadeatly.